This Super Green Smoothie is one of the most delicious and healthy breakfast smoothie recipes. Add this spinach smoothie to your healthy smoothie recipes and enjoy. We are always on the go and it is difficult to eat healthier, it’s also difficult to reach our goals of 5-9 vegetables and fruit each day. And it’s even more challenging to obtain our nutrient-rich leafy green quota for the week. So what if I told you that with one delicious smoothie, you could check off one serving of leafy green veggies and two servings of fruit for the day? Ever since Popeye downed that spinach to build those muscles, we have been taught that spinach is one of the world’s top healthiest vegetables. We know we need to eat more spinach but it’s difficult and it’s even more difficult to get our children to eat it. I grew up watching Popeye but that didn’t get me to grab that can of spinach and can opener. This Super Green Smoothie is sweet and delicious and other than the color no one would suspect that spinach is one of the main ingredients. 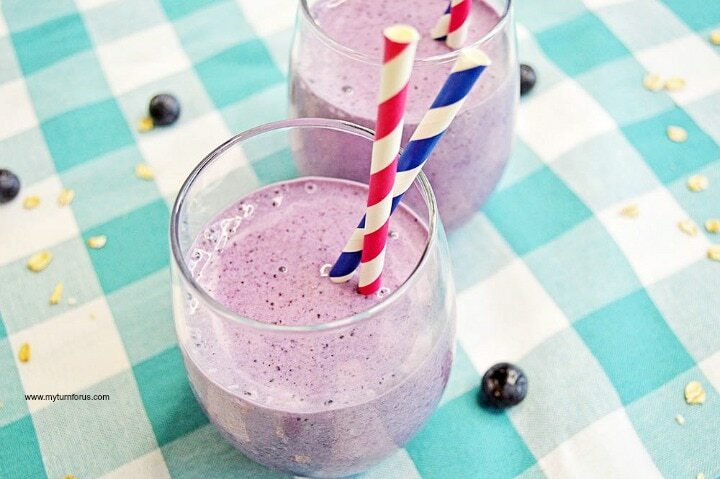 It’s on the top of our list for healthy breakfast smoothie recipes. In fact, this green smoothie contains 1/2 cup of leafy green spinach per serving. It doesn’t contain any added sugar but does have natural sugar from the fruit. At only 100 calories, 13 grams of protein, 4 grams of dietary fiber and only 3 grams of fat, a green smoothie is a powerful fuel. We have several healthy smoothie recipes below to add a little variety to your diet. It’s not just for the convenience of obtaining our vitamins that we add a green smoothie to our menu several times a week, we add it for an extra treat. This smoothie is already sweet and delicious but it can be “Great” by adding one serving of whipped topping! This looks yummy! I shared a green smoothie on my blog yesterday too! I see them everywhere, but I have yet to see two of the same. Love the versatility of the drink! YUM! and healthy. A good combo. You're so brave!! I've been wanting to try making a green smoothie but I am so afraid of the taste, but you may have just inspired me! And what better timing than St Patrick's Day?? I resisted for so long, as I also thought drinking spinach was going to be something awful. Au contraire my friends, it was delish ♥ I used peanut butter and other good things, no fruit in that one, but you could if you like to. I pinned that. It looks great! And lots better than McDonalds, for sure! Bah!! At least it looks great. And a good time of year to try to convince me about the merit of a green shake. Green. again…bah!! But, if you think it tastes good…maybe I'll have to try it! Thank you so much for linking up with Friday Chaos. I want to try this. I love spinach. Is the ginger taste strong? I don't know if I like ginger. Swinging through with the blog hop. Hope you have a great day! 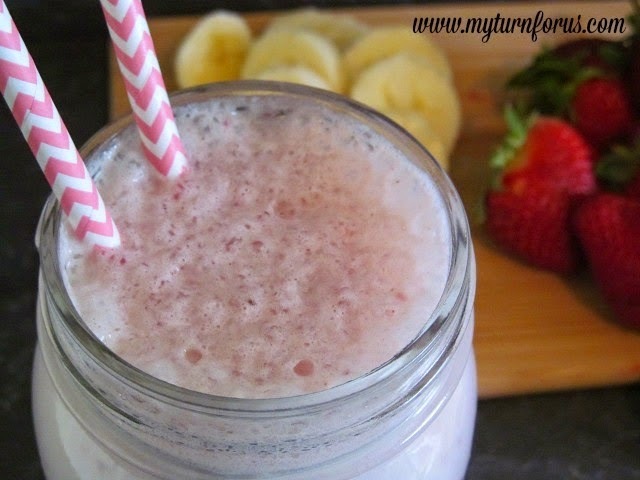 This smoothie is perfect for upcoming holiday!!! I'll definitely try this one! By the way, I'm hosting a Link-Up party and would be thrilled if you decided to participate!!! I made it by to link up for the hop this week and was ready to search for a green shake/smoothie recipe this morning–and I think this is exactly what I'm looking for! I will just love your smoothie! Have a great St. Patrick’s Day and thank you so much for sharing with Full Plate Thursday. You sure are eating healthy… great timing on the green smoothie. Happy St. Patrick's Day. I've always been skeptical to try green smoothies. But I trust your judgement! Thanks for linking this week! I've been a little hesitant to try the green smoothies that are so popular right now. But maybe I'm convinced now. I may try it after I go to the grocery store. I really need to get on the green smoothie bandwagon. Your addition of mango and pineapple sound perfect for me. Thanks for sharing on Thursdays Treasures. I've yet to try spinach in smoothies, but this one sounds delicious. Thanks for sharing with Simple Supper Tuesday. Ive been wanting to try these too. I'm glad you went first 😉 Seriously though it doesn't sound bad to me. I think spinach has such a mild taste that the fruit takes vented stage. Ive got to try it now!! Thank you for sharing at Party In Polka Dots! It looks like you guys had a fun St. Patty's Day! That sounds really good! I'll have to try this one; it looks like a great Christmas treat, too 🙂 At least it's green! Thanks for hosting the Let's Get Social Sunday link-up!